"New Texas Blues with respect for tradition." Hey, welcome! We’ve been expecting you! Make yourself at home here on Sweet Mama’s Home Page. 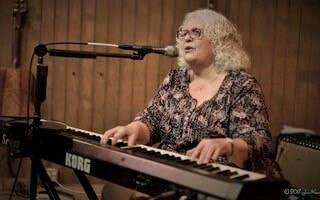 Here you will find out about musician/singer/songwriter/comedienne Marcy Rae, alias Sweet Mama Cotton. Learn about all the cool projects she is involved in these days, and what she has to say about her music, life in Houston, and the general state of things in the world of Sweet Mama Cotton. Find out what others think of Sweet Mama's music, and where she likes to go when she's surfing the web. Pull up a chair and check out Sweet Mama Cotton. Contact Me to Book your special events, order your favorite music, sign my mailing list. From Sweet Mama Cotton’s latest album, SUH-WEEET. With Mark Switzer at Kulak’s Woodshed in North Hollywood, CA. With the Noam Dayan Blues Band at Jacob’s Ladder Festival in Nof Ginasaur, Israel, on the Sea of Galilee.